Most bacteria form biofilm communities on interfaces, showing complex interactions and resilience against noxious agents. Our understanding of these functional communities is limited because only a minority of these bacteria can currently be isolated. To study functional communities organized in biofilms, several microcosms are presented where samples from the environment are placed in a vessel, covered with water, and a slide carrying hydrophobic compounds underneath is floated on the surface. Bacteria migrate to these substrata and form complex biofilms. The microcosms can easily be adapted to specific research requirements making the whole approach very flexible. 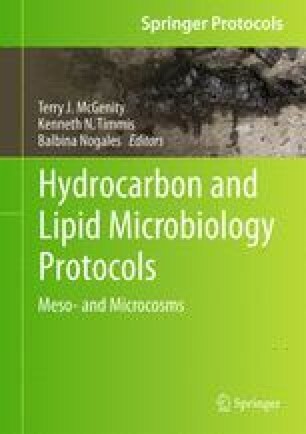 The microcosms can be used to grow biofilm communities which can be characterized by confocal laser microscopy, phylogenetic fingerprinting of the community composition, stable isotope probing, and chemical analysis of pollutant degradation. The biofilms can be used (1) to enrich degraders of the substrates, (2) to monitor biofilm structure and composition over time, (3) to compare biofilm communities, (4) to follow the flow of carbon from the substrates to biomolecules, and (5) to monitor the effect of added bioactive compounds on biofilms. The microcosms can also be adapted for the screening of novel materials for their influence on biofilm composition, structure, and activity. I would like to acknowledge the contributions of several PhD students to this approach, especially of Susanne Tillmann, Alexandre J. Macedo, and Marcela G. Heck, and the excellent technical assistance of Jennifer Knaak.